It is again time to recongnize some of the outstanding faculty and staff of the Scott College of Business. 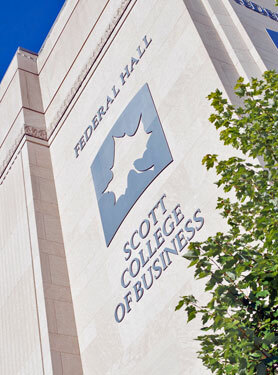 Someone who forwards the mission and goals of the Scott College of Business. The award is open to anyone, including faculty and staff. A business alumnus who graduated within the last 10 years. They have achieved success in their career field and are recognized for early professional achievements by others within their profession, field or organization. A college of business educator who has contributed greatly to student success. An influential person who initiates events and inspires people for the success of the college of business. Someone who drives innovation, student empowerment, and hands on learning. Innovations may be reflected in new curricula, new methods of delivery, expanded programming, and/or experiential learning. A business or corporation who contributes to the success of the Scott College of Business through mentoring, field experiences, internships, hiring of our graduates, and/or contributing funds to help the success of our students and current graduates. Someone who achieved success in his/her career field and has contributed to the success of the Scott College of Business. Someone who has contributed to the success of the Scott College of Business. We ask your favor in nominating individuals for awards and providing a brief description why you think the person qualifies for the award. The awards will be presented to recipients on our first annual “Day of Thanks” on Monday, November 5. Nominations will close on Monday, October 1. The nomination form can be found here. We look forward to your nomination(s). If you have any questions, contact Ruth Rukes at 812.237.7699. Thank you for your support of the Scott College of Business and Indiana State University.